October is what we call ‘in-between-month’: the monsoon is over but it can rain at times. It can be hot but the winter slowly starts at the end of the month. The tourist season hasn’t started yet but the room rates are rising. October brings also a sheer variety of weather zones to India. While the retreating monsoon hits Tamil Nadu and Kerala, it starts to snow in Ladakh and Uttarkhand in North India. While it can get hot in central India and Rajasthan, the cold takes over in the hill stations up North. So if you are planning to tour all over India you better pack onion-style: many layers which can be removed. While the weather surely plays an important role to choose the best time to travel to India another factor demands attention too: national and cultural festivals. October has lots of them which we will explain below. But first, let us dig into the different climates zones in India in October. October is the perfect time to hit the mountains up north and northeast. But don’t go too far in: the high altitude regions in Uttarkhand, Himachal Pradesh and in Ladakh (Jammu, Kashmir) get already very cold. You might even face snow and if so, many roads and villages will be cut off due to the weather conditions. However, you can visit Rishikesh, Shimla, Manali, Dharamsala and the surroundings without issues and even enjoy great hikes and clear views. Pack some warm clothes too as it can get cold at night! Read more about adventure travel routes in the Himalayas here. Rajasthan can be very hot in the day time, up to 35°C and higher. It usually doesn’t rain in Central India in October but it can still occasionally happen. The temperature drops in the night, so pack a sweater and socks for dinners outside or an optional overnight-camel-safari. 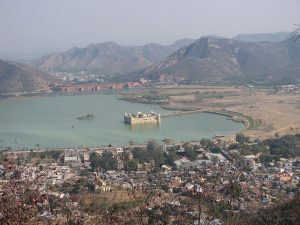 Find some popular travel routes for Rajasthan here. The main tourist season starts around mid-October so even though the room rates aren’t hitting their maximum, the prices aren’t as low as they were in the previous month. Kerala receives a good amount of rain in October as the retreating monsoon from the northeast (the second monsoon hitting India every year) arrives. It is not as much as it was in June or July but it is more than in September. The rain can come with heavy downpours and long lasting storms. It is not the best time to visit the beaches but is more fun in the mountains. The landscapes are still coloured in a lush green and the lakes, rivers and waterfalls are filled with streaming water. It can get quite warm in the lowlands and cool in the mountains with temperatures varying from 16 to 30 °C. Here, you would need to be prepared for every weather change possible: from drizzle to storm, from cloudy to sunny, from hot to cold. 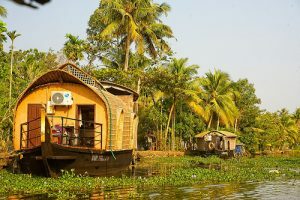 See four popular routes for Kerala here. Karnataka’s climate is almost the same as Kerala’s but there is less rainfall. We have a suggestion for a backpacking tour in South India for you here. Tamil Nadu’s main rain season starts mid-October and lasts until mid-December. The region receives less rainfall in the south-west monsoon from June to September and therefore it gets really wet in the last quarter of the year. It’s better to avoid the east coast like Pondicherry, Mahabalipuram and Chennai in October. In Goa business is slowly picking up by the middle of October with many resorts and restaurants reopening for the new season. South-Goa is still slow and won’t be very hospitable until November. You can definitely already have a good time at the beaches of North-Goa! It can be hot and it might storm on some days but that should be a rare occasion. While the weather can be quite unpredictable in October, we are 100% certain that you will experience at least one great Hindu festival! Probably even the biggest of them all: Diwali, the ethereal festival of light. In many parts of the country the festival lasts five days and people travel far to visit relatives and friends. Many consider it as a new year celebration with fireworks and crackers. It’s a magical time to be in India. We recommend you stay at a homestay with a Hindu family who will invite you to participate in the ceremonies. Plan your trip with us and we make sure you can experience the authentic and exciting Diwali festival. This time has a major drawback: since many locals are travelling to visit home or relatives train and flight tickets are very expensive or even booked out long in advance. Hence, it is better to travel in one region the week before and after Diwali. You might be able to catch cheap flights on the day of Diwali but definitely not around the day if you are more of a spontaneous traveller. Good news: Hotels are often cheaper during Diwali as domestic tourism is low. Rajasthan has many fun local events happening in October like the Marwar Festival, the Rajasthan International Folk Festival in Jodhpur and the Pushkar Camel Fair! 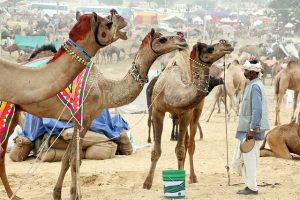 This is one of the biggest folk festivals in India and the biggest camel fair in the world. The first days are all about camel trading, races, music and folk. For the last day, many pilgrims flock to the small town for a religious ceremony. 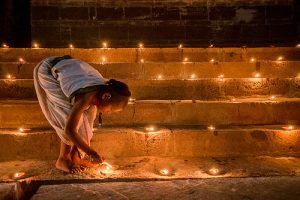 In the final full moon night Hindus bathe in the holy lake to free themselves from all sins and light up the town with oil lamps and fireworks. It would be very crowded and it is hard to find available accommodations. Prices are 5-10 times higher than the usual room rates in the rest of the year, but it is surely a great experience. 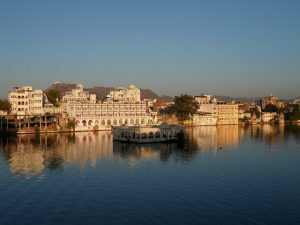 We can help you plan a visit to Pushkar well in advance but we might not be able to find accommodation for spontaneous travellers. Ashura Festival. A Muslim festival that celebrates the martyrdom of Hazrat Imam Hussain, the grandson of the Holy Prophet. A large procession happens every year in Udaipur. Navaratri & Dusshera. A nine-day long festival celebrating all forms of the mother goddess. People fast in the day and dance and feast at night. On the 10th day Dussehra, the victory of good over evil, is celebrated. The biggest celebration happens in Kolkata (Durga Puja). You can also observe the ceremonies all over Gujarat, Rajasthan, in Delhi, Varanasi, Mumbai, Mysore and in the small town of Kullu in Himachal Pradesh. If you are thinking about travelling to India in October, plan your trip with us and we make sure to create a trip experience of a lifetime for you and your family and friends.